Just as the ear has two purposes — hearing and telling you which way is up — so does the eye. It receives the input necessary for vision, but the retina also houses a network of sensors that detect the rise and fall of daylight. With light, the body sets its internal clock to a 24-hour cycle regulating an estimated 10 percent of our genes. The workhorse of this system is the light-sensitive hormone melatonin, which is produced by the body every evening and during the night. Melatonin promotes sleep and alerts a variety of biological processes to the approximate hour of the day. Light hitting the retina suppresses the production of melatonin — and there lies the rub. In this modern world, our eyes are flooded with light well after dusk, contrary to our evolutionary programming. Scientists are just beginning to understand the potential health consequences. The disruption of circadian cycles may not just be shortchanging our sleep, they have found, but also contributing to a host of diseases. “Light works as if it’s a drug, except it’s not a drug at all,” said George Brainard, a neurologist at Thomas Jefferson University in Philadelphia and one of the first researchers to study light’s effects on the body’s hormones and circadian rhythms. Any sort of light can suppress melatonin, but recent experiments have raised novel questions about one type in particular: the blue wavelengths produced by many kinds of energy-efficient light bulbs and electronic gadgets. Dr. Brainard and other researchers have found that light composed of blue wavelengths slows the release of melatonin with particular effectiveness. Until recently, though, few studies had directly examined how blue-emitting electronics might affect the brain. So scientists at the University of Basel in Switzerland tried a simple experiment: They asked 13 men to sit before a computer each evening for two weeks before going to bed. During one week, for five hours every night, the volunteers sat before an old-style fluorescent monitor emitting light composed of several colors from the visible spectrum, though very little blue. 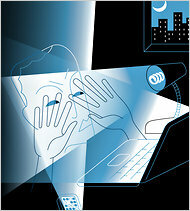 Another week, the men sat at screens backlighted by light-emitting diodes, or LEDs. This screen was twice as blue. “To our surprise, we saw huge differences,” said Christian Cajochen, who heads the Center for Chronobiology at the University of Basel. Melatonin levels in volunteers watching the LED screens took longer to rise at night, compared with when the participants were watching the fluorescent screens, and the deficit persisted throughout the evening. The subjects also scored higher on tests of memory and cognition after exposure to blue light, Dr. Cajochen and his team reported in the May issue of The Journal of Applied Physiology. While men were able to recall pairs of words flashed across the fluorescent screen about half the time, some scores rose to almost 70 percent when they stared at the LED monitors. Still, nobody is suggesting that we all turn off the lights at dusk and sit in the dark; research into this area is in its infancy. “We are only beginning to understand what really happens under natural conditions,” said Mark Rea of the Lighting Research Center at Rensselaer Polytechnic Institute in New York. In January in the journal PLoS One, the University of Basel team also compared the effects of incandescent bulbs to fluorescents modified to emit more blue light. Men exposed to the fluorescent lights produced 40 percent less melatonin than when they were exposed to incandescent bulbs, and they reported feeling more awake an hour after the lights went off. In addition, the quantity of light necessary to affect melatonin may be much smaller than once thought. In research published in March in The Journal of Clinical Endocrinology and Metabolism, a team at the Harvard Medical School reported that ordinary indoor lighting before bedtime suppressed melatonin in the brain, even delaying production of the hormone for 90 minutes after the lights were off, compared with people exposed to only dim light. What do these findings mean to everyday life? Some experts believe that any kind of light too late into the evening could have broad health effects, independent of any effect on sleep. For example, a report published last year in the journal PNAS found that mice exposed to light at night gained more weight than those housed in normal light, even though both groups consumed the same number of calories. Light at night has been examined as a contributor to breast cancer for two decades. While there is still no consensus, enough laboratory and epidemiological studies have supported the idea that in 2007, the World Health Organization declared shift work a probable carcinogen. Body clock disruptions “can alter sleep-activity patterns, suppress melatonin production and disregulate genes involved in tumor development,” the agency concluded. Blue light’s effects might be particularly pronounced for shift workers and others who get little natural daylight, some researchers say. Consider one small trial that appears the June issue of The Journal of the American Medical Directors Association. Among 28 elderly nursing home residents, those exposed to just 30 minutes of blue light on weekdays for four weeks showed improvement in cognitive abilities, compared with patients exposed only to red. Researchers like Dr. Brainard hope the science may lead to a new generation of lights and screens designed with wavelengths that adjust according to the hour of the day. Among those interested are officials at NASA, who have approached the neurologist about designing light on the International Space Station in a way that promotes alertness during waking hours and encourages sleep during times of rest.